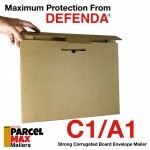 ParcelMax Mailers are a strong alternative to traditional board backed & all board envelopes. Constructed from high quality corrugated board they provide superb rigidity along with the added benefit of cushioning their contents within corrugated fluting. 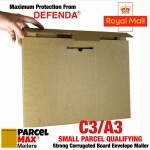 Available as stock items in C3 / A3 and C2 / A2 sizes they can also be supplied in C1 / A1 size as bulk orders. They represent the best means of shipping sizeable items through courier or postal services and their superior protective properties makes them the preferred envelope for artists and others working in the creative industries.